For vehicles with towing bracket. Lockable, for one or two bicycles with a maximum load weight of 60 kg. Rapid installation thanks to simple coupling mechanism. 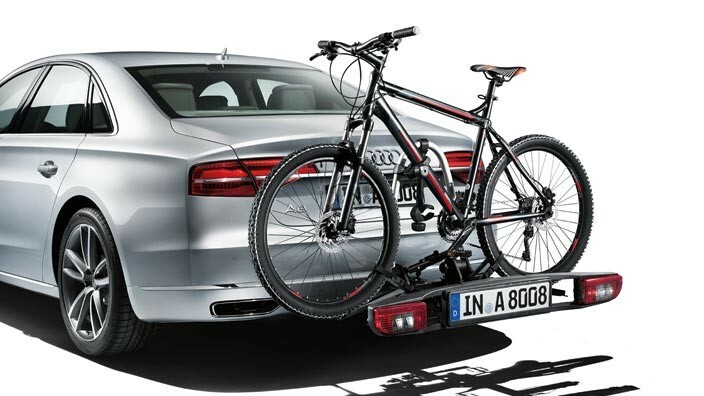 The bicycle carrier can be folded away with a few hand movements to open the luggage compartment. Folds together, can be stored in bag provided to save space. Optional: expansion kit for third bicycle. All Genuine Audi Accessories can be purchased at an accredited Audi Dealership nationwide. To receive details about this Audi Genuine Accessories item via email, please select "Email Me"
© 2017 AUDI SA. All Rights Reserved.